Background: Colon cancer is the most aggressive form of cancers, that causes 0.5 million deaths per year around the globe. Targeting colon cancer by conventional therapeutic options elicits toxicity. Traditional medicines take a lead to alleviate the existing clinical challenges. Objective: To investigate antibacterial activity against Helicobacter Pylori and in vitro anti-colon cancer activity by Acacia nilotica extract (ACE) and its active constituent pyrogallol. Methods: Pyrogallol isolated from A. nilotica by column chromatography and HPLC and structure was elucidated by spectral analysis. Antibacterial activity was done by flow cytometry. Cytotoxicity was measured by MTT assay. Apoptotic morphology and nuclear fragmentation were assessed with AO/ethidium bromide and DAPI staining. DNA fragmentation was done by electrophoresis. Western blot used to analyze the molecular mechanism of apoptosis. Cell cycle arrest was determined using flow cytometry of propidium iodide stained cells. Cell migration was determined by wound healing assay. Results: ACE (20 µg/ml) and pyrogallol (10 µg/ml) treatment reduced the survival of H.pylori at 61% and 62%, respectively. MTT results show that HT-29 cells are more sensitive to pyrogallol with an IC50 value of 35μg/ml compared to ACE. Pyrogallol treated HT-29 cells reached dead state i.e. late apoptotic state with severe nuclear fragmentation. Pyrogallol elicits dose dependent DNA fragmentation in HT-29 cells. Pyrogallol induced apoptosis by simultaneous down-regulation of Bcl-2 and up-regulation of BAX and cytochrome c. Pyrogallol arrested HT-29 cells in S and G2/M phase of cell cycle. 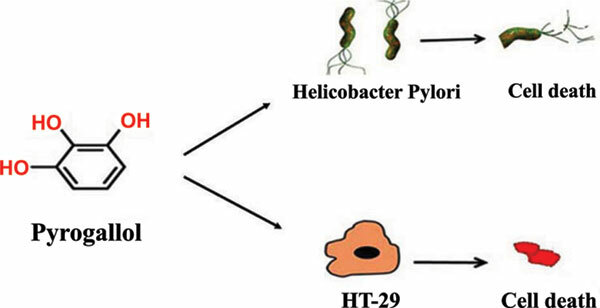 Further pyrogallol exhibited marked antimetastatic potential by inhibiting the migration of HT-29 cells dose dependently. Conclusion: Both ACE and pyrogallol repressed the growth of H.pylori and as significant anti-colon cancer agent. Acacia nilotica, pyrogallol, Helicobacter pylori, colon cancer, apoptosis, HT-29.